Why is the script loading so many times ? This tutorial will get you started from scratch to a working script. We will assume you have installed Trisul and Web Trisul. You do not need to install LUA because it is embedded into the Trisul Probe. Lets get started with a simple “hello world” example. We will run the script first, see its output, and then start exploring it. GOALS Get started by learning where to place LUA scripts, how to run in development mode, how to view logs. Note the following six points. 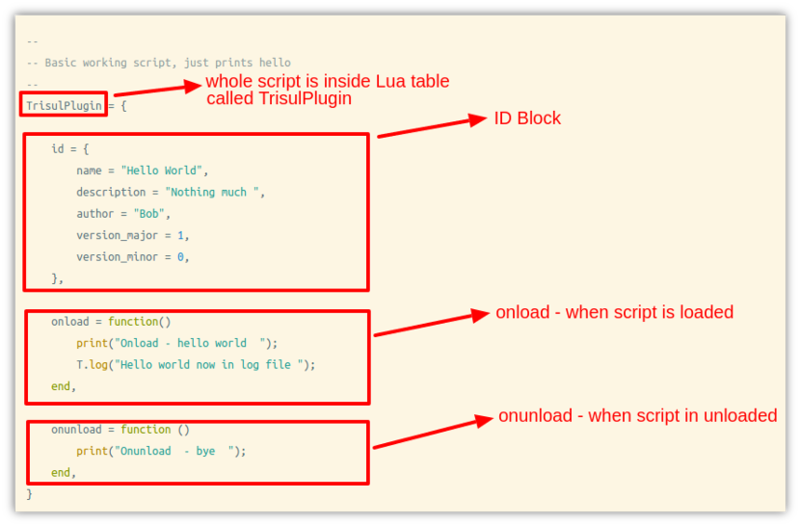 That is the model of the Trisul LUA API, your script will be called at various times depending on the type of script. You may have noticed that the print messages appear multiple times. The Trisul engine can spin up multiple instances of your LUA script depending on the threading setup. It can also load and unload during the probing/discovery process. This brings us to one of the big rules of LUA scripting with Trisul. Your script can be loaded and unloaded many times and multiple instances of your script might be running at the same time. If running with the -demon option, Trisul overwrites the LUA print(..) function with its own. So you print messages show up in the log files with a DEBUG level. This allows you to grep for hello.lua to only see messages from your script. Some useful tips for development.